Brok the Brachiosaurus is tough and easy going, but don’t get on his bad side! This 2-in-1 toy switches between a dinosaur and a truck. Press the talk button to hear fun phrases and facts. Press the sound button to hear sound effects. Just Switch and Go! LCD screen displays driver and Dino faces and action buttons play awesome facts and sounds. This toy costs approximately £19.99 (for the latest and best prices make sure you check our retailer list for the VTech Switch and Go Dinos Brok the Brachiosaurus above). 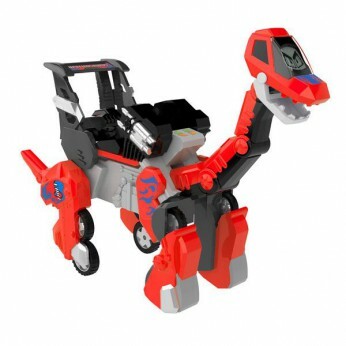 In our review of VTech Switch and Go Dinos Brok the Brachiosaurus we classed it as being suitable for ages 3 years, 4 years, 5 years but recommend you check the manufacturer specific advice before purchasing.